This Pork Takeout Fake-Out recipe came about as the result of needing to use up vegetables we had in the refrigerator and my mom’s desire to have Chinese food Friday night. My parents were scheduled to visit this past weekend. So, Thursday evening of last week, I took two packages of thinly sliced pork out of our freezer so I could cook it on Friday. I didn’t have a plan for that pork, but I was tired. I told myself “I’ll figure it out later” and went to bed. Friday was a busy day with my parents, and soon enough it was dinner time. My mom suggested we just get Chinese food, but I had defrosted pork! Plus, we had a bunch of veggies in our refrigerator that needed to be eaten soon. So, I quickly formulated a plan for some “takeout fakeout” and got to work. My parents loved it. I did, too. Pour the marinade over pork pieces in a medium-sized dish or ziplock bag, and mix well. Marinate in the refrigerator for at least 30 minutes, up to 4 hours. Heat the sesame oil over medium-low heat in a wok, stir-fry pan, or large skillet. Add onion and sauté for 1 minute. Add the garlic and ginger and sauté for 30 seconds. 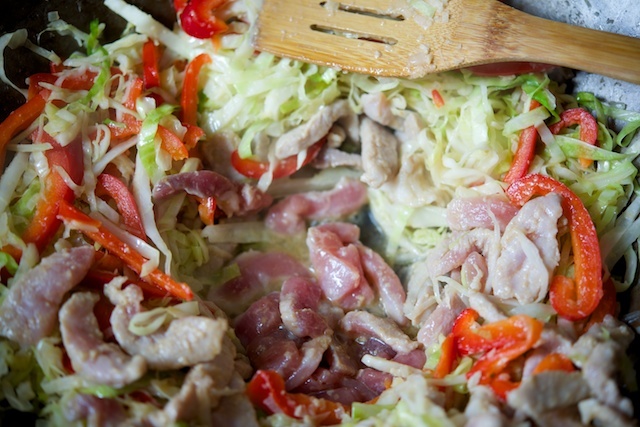 Add the shredded cabbage and mix well with the onion, garlic, and ginger. Continue to sauté for 2 to 3 minutes, until softened. Make a pocket in the middle of your wok or pan by pushing the everything to the sides, add 1/2 Tbsp coconut oil and let it melt. Add the red bell peppers and sauté for 2 minutes. Then, incorporate with cabbage and push to sides to make another pocket in the middle. In small batches, add pork pieces. Sauté each batch for 3 to 4 minutes, until pieces are mostly cooked; then push aside to add next batch of pork. When done, incorporate the pork into the rest of the ingredients. Add coconut aminos and chili paste (optional) and mix everything together. Sprinkle in the carrot slivers and incorporate them into the mixture. Finally, add the green onions and sauté everything for 2 to 3 minutes. Serve with sides of coconut aminos and/or chili paste, and enjoy! 1. Mix the marinade ingredients together in a small bowl. 2. Pour the marinade over pork pieces in a medium-sized dish or ziplock bag, and mix well. Marinate in the refrigerator for at least 30 minutes, up to 4 hours. 3. Heat the sesame oil over medium-low heat in a wok, stir-fry pan, or large skillet. Add onion and sauté for 1 minute. Add the garlic and ginger and sauté for 30 seconds. 4. Add the shredded cabbage and mix well with the onion, garlic, and ginger. Continue to sauté for 2 to 3 minutes, until softened. Make a pocket in the middle of your wok or pan by pushing the everything to the sides, add 1/2 Tbsp coconut oil and let it melt. Add the red bell peppers and sauté for 2 minutes. 5. Then, incorporate with cabbage and push to sides to make another pocket in the middle. 6. In small batches, add pork pieces. Sauté each batch for 3 to 4 minutes, until pieces are mostly cooked; then push aside to add next batch of pork. When done, incorporate the pork into the rest of the ingredients. 7. Add coconut aminos and chili paste (optional) and mix everything together. Sprinkle in the carrot slivers and incorporate them into the mixture. Finally, add the green onions and sauté everything for 2 to 3 minutes. 8. 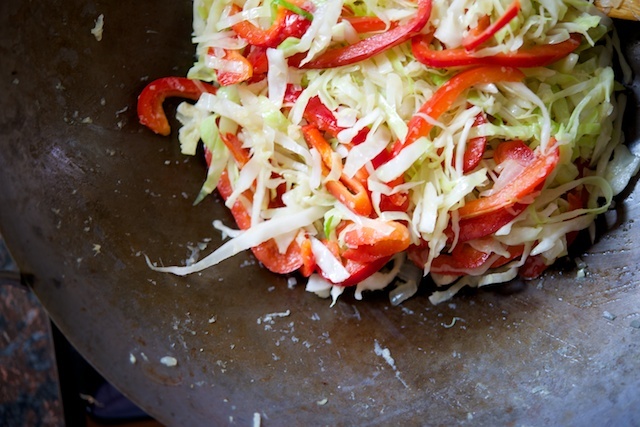 Serve with sides of coconut aminos and/or chili paste, and enjoy!